Chef Ben Ford officially earned his cooking stripes at some of the country’s most established restaurants and alongside several of America’s treasured culinary icons before taking on his own restaurant kitchen and earning the prestigious Cochon555 award. Today, he has a successful Ford’s Filling Station L.A. LIVE at the JW Marriott in downtown Los Angeles and Ford’s Filling Station located in the Delta Terminal at LAX. 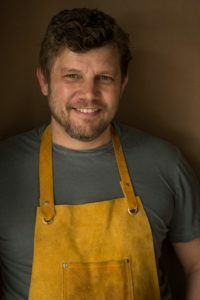 In May 2014, Ben released his first cookbook, Taming the Feast: Ben Ford’s Field Guide to Adventurous Cooking, which focuses not only on bringing people together to eat good, sustainable organic food, but gathering lots of people together to eat sumptuous feasts. A nod to his mother’s culinary influence and father’s craftsmanship, Ben adopted the ability to create with his hands, a skill that eventually found its way into his cooking. Ben graduated from the California Culinary Academy in San Francisco where he was schooled in the ethos of using local seasonal ingredients by the country’s most prolific organic chef, Alice Waters, at the famed Chez Panisse in Berkeley, California. He returned to Los Angeles and honed his traditional French-cooking techniques as Sous Chef at Eberhard Mueller’s Opus in Santa Monica. After tenures at two seminal Los Angeles restaurants, Campanile and Eclipse, Ben was named Executive Chef and created the concept for The Farm of Beverly Hills. Prior to conceptualizing Ford’s Filling Station, Ben opened Chadwick, a restaurant whose local and seasonal high-end California-Mediterranean menu earned him rave reviews and national acclaim, including a coveted three stars from the Los Angeles Times, one of the first restaurants in Los Angeles to receive this high rating. For more about Ben, please visit www.chefbenford.com.